In a small pot, combine sugar, butter, heavy cream and salt. Stir on low heat until you have the caramel sauce. Adjust the seasoning and set aside until it cools a little. Cut apples in the desired thickness and arrange them on a dish or tray. Drizzle them in the caramel sauce and sprinkle the pieces of nuts over the fruit. To save time, you can use store-bought caramel sauce. 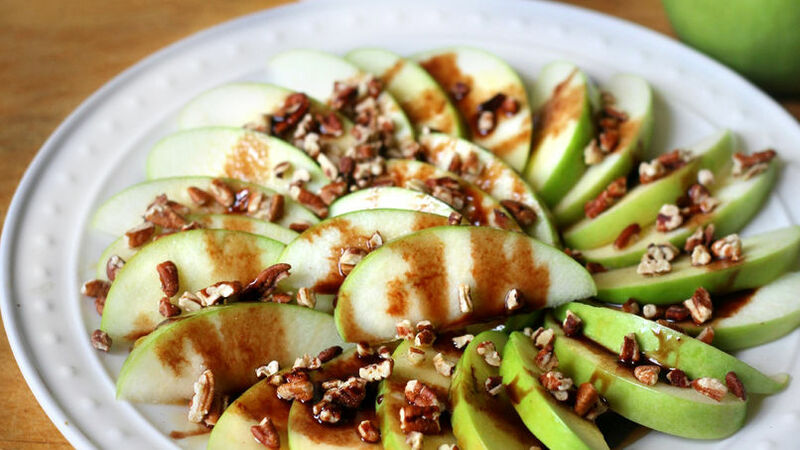 These apple and caramel nachos are one of the easiest and most delicious desserts you can make. The special touch comes from the sweet caramel sauce that contrasts perfectly with the sliced green apples. You can even add some chocolate syrup or your favorite sweet sauce. I also love this dessert because it has pieces of nuts and that makes its presentation even more surprising. What other ingredient would you add?